It's always hard to know what to download for an audio book on the road trip home from Florida. Our tastes in reading are a little varied. I thought perhaps we were due for a classic mystery and Agatha Christie came to mind. I don't recall ever having read it and I doubted that Bob had so it was our first book to listen to as we set out from "sunny" Florida--it was actually pouring rain. The audio book took a little getting used to. The reader was doing a lot of accents for the various people in the story and his British narrative was a bit heavy. Eventually though we got used to it and I think he lightened up a bit as we began to understand who the characters were. 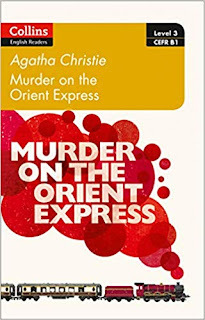 For those of you who have never read this well-known novel, it takes place on the Orient Express, which is a train route through Europe. Back in the day, it was the best way to get from Istanbul to Paris. The story includes Hercule Poirot, the famous detective in many of Christie's novels. He boards the train as a last minute change in his schedule and finds himself having to solve the murder of a man aboard the train. The train gets stuck along the way in a snow bank so Poirot has plenty of time to figure out all the likely suspects. The whole audio book is about six hours long. About five hours into it, we made another coffee stop at McDonald's and as we are exiting the car Bob exclaims, "I know who did it!" and then proceeds to tell me. "I think I saw the movie." Oh yes, he was right. But in case you haven't seen the movie or read the book, I'll leave you guessing. It was a nice "read" and a good book for the road trip.